Lately, I have been on a bit of a local chevre streak. I consider local, hand crafted cheese a true treat, and goat cheese is special in how easily it pairs with just about everything. It's also easy to digest in comparison to other pasteurized cheeses, due to the lack of homogenization (most often applied to milk from cows to distribute fat). Additionally, goat milk is made up of medium chain triglycerides (MCT's), rather than long chain triglycerides, requiring fewer steps and enzymes during the process of digestion. So, maybe I have gotten a little heavy handed, (and long winded to boot), but keep this recipe in mind when you have a summer party to attend. It makes for the greatest little nibble. Preheat oven to 375. Line a baking sheet with parchment. Cut away beet greens (save for another application), and rinse roots. Place beets on the lined baking sheet and roast until tender, time will vary depending on size. Pierce thickest portion of beet with a fork to check for tenderness. When it goes in without the slightest protest, remove beets from oven. Cool completely before peeling away skins. Slice with a very sharp knife into 1/4 inch rounds. 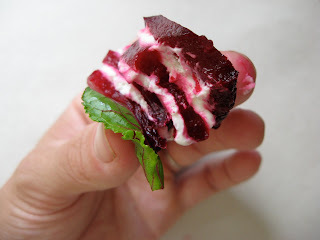 Place a small amount of goat cheese between beet slices to make little stacks. Press down on the top of each stack to encourage the cheese to emerge slightly from between the layers. Garnish each stack with a little beet green. Try and assemble shortly before serving, as the color from the beets will bleed into cheese. If you don't mind this colorful merger, stacks can be made in advance and stored in an airtight container in the fridge. Beautiful! I love the beet greens as garnish. Mint leaves would make a zesty flourish, too! Trying it as soon as the harvest bow arrives with beets!